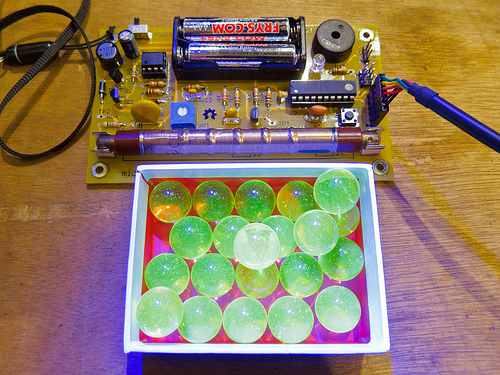 Want to check if your freshly-assembled MightyOhm Geiger Counter kit is working? You’ll need something radioactive! But why pay over $100 for a professional test source when there are plenty of cheap and readily available radioactive items available at your local antique store or online? The disadvantage of using these sources is that you won’t be able to calibrate your geiger counter, but for simple go/no-go testing (which is what most people need) these are perfect! Often called vaseline glass or depression glass, uranium glass contains a small amount of uranium, which makes it slightly radioactive. It also fluoresces brilliantly under UV light! Uranium glass is commonly found in depression-era glassware, the glass-to-metal seals in some old vacuum tubes, and most commonly in the form of green glass marbles on eBay. According to this study by the Oak Ridge Associated Universities, accidental uranium ingestion resulting from using all Fiesta-ware dinnerware every day was “the highest dose calculated in any of the exposure pathways considered…” The glaze used on these plates also contains lead, so I highly recommend using Fiesta-ware to show off your gieger counter, not at the dinner table! 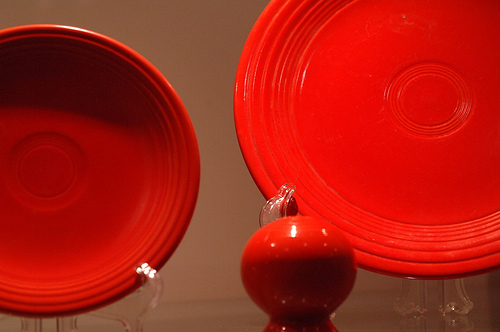 Orange or red Fiesta-ware that is sold today is not radioactive. It is my understanding that uranium oxide hasn’t been used in dinnerware much since the 1970s. Note that the use of uranium oxide was not restricted to Fiesta-ware, it was also widely used in the manufacturing of ornamental ceramics such as bathroom tiles. Fun fact: Red Fiesta-ware was discontinued during WWII after the US government seized the company’s stocks of uranium. 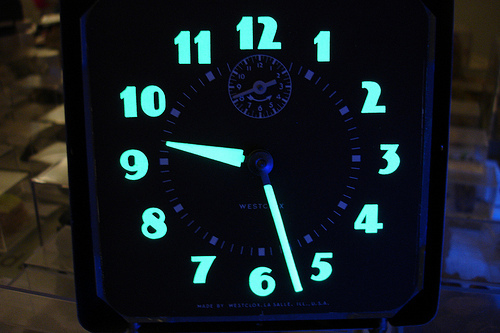 Vintage watches and aircraft dials may contain radium, which was used to make them glow in the dark. Radium is over one million times more radioactive than Uranium, emits all kinds of radiation (alpha, beta, and gamma), and should be handled with care. Nonetheless, radium dial watches are fairly common in antique shops and I have seen radium dials on aircraft gauges in surplus stores. Note that the paint will stop glowing long before the dial stops being radioactive (radium has a half life of 1600 years), so bring a geiger counter. Note: To my knowledge, radium is (thankfully) no longer used to make glow in the dark watches. It has been replaced by Tritium gas (which is an alpha-emitter but the alpha radiation is blocked by the walls of the vial containing it a beta source) or more commonly zinc sulfide. 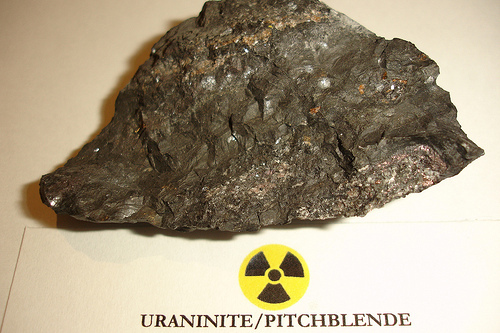 Uranium ore (uraninite or pitchblende) is commonly available on eBay and from United Nuclear. Camping lantern mantles manufactured before the 1990s are likely to contain thorium, which makes them burn more brightly. Note: Most lantern mantles sold at camping goods stores today contain Yttrium instead of thorium. They are (sadly) not radioactive. 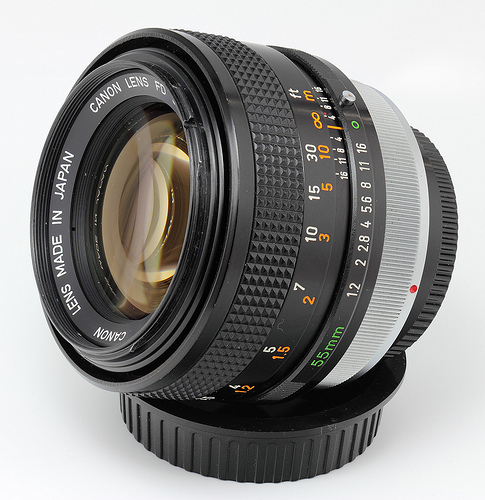 Some 1970s-vintage camera lenses contain thorium, which is used to increase the index of refraction in glass. These are probably rare, but you just might stumble upon a Thoriated lens in an antique shop or surplus store, so I thought I would mention them here. Some TIG welding rods are radioactive because they contain thorium. Not all household smoke detectors are radioactive, but even the ones that are radioactive are not good test sources for my geiger counter kit. Why? 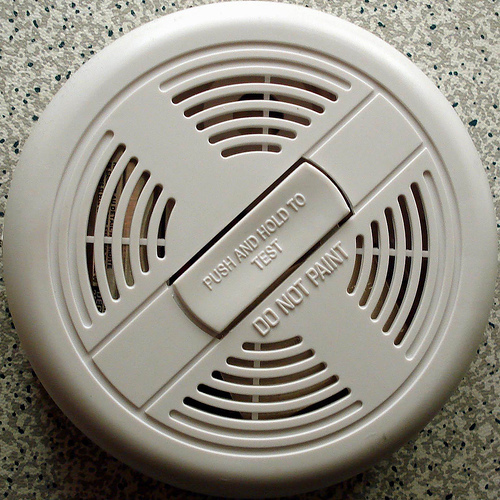 Because smoke detectors use Americium, a powerful alpha emitter. Not only is Americium dangerous to handle (ingestion of alpha-emitters can be very harmful), but the SBM-20 tube used in my geiger counter kit isn’t sensitive to alpha radiation, so you’ll only get a faint and very disappointing reading from the beta/gamma radiation emitted by Americium’s decay products. Fun fact: People are radioactive too! That’s all for now! The Oak Ridge Associated Universities website includes an interesting page that lists several other radioactive consumer products. Have fun feeding your MightyOhm Geiger Counter kit, and most importantly, be safe! Do you have any more suggestions for readily-available radioactive test sources? Leave a comment below! There were, and still might be static-charge neutralizing brushes, iirc Staticmaster brand, which contain a strip emitter using iirc polonium-210, as an alpha emitter. The polonium decays in years, so replacement strips were sold. I don’t know about β or γ, though. A story about a nuclear facility said that employees arriving for work with bananas for lunch are OK, but leaving was not. There is a mistake in this page which should be corrected to prevent misinformation and possible accidents. In the section on Tritium, it says tritium undergoes radioactive decay by alpha emission. This is not accurate. Tritium (H3) undergoes beta decay. Not alpha. I wear a large tritium isotope on a silver rope chain necklace and it decays by beta. The betas hit the phosphor coating on the inside of the glass vial, exciting the electrons, which then release that energy in the former of photons. Ruben – Thanks for pointing this out, I’ll update the post. Did a patent search, nothing came up which is very unusual. The really strange thing is that several “betavoltaic” setups need a low level source and 40K would be ideal if it wasn’t so hard to collect enough. I worked out that just under 0.7 tons of lo-salt if all its 40K was extracted would be 30K times background for that tiny 2g sample which would be fine for my purposes. Thoriated optics are not as rare as you think. *Many* Kodak lenses between the 40s and late 60s are radioactive as are a fair number of 60-80s Pentax lenses and quite a few other manufacturers. The tell-tale sign of a thoriated lens is a yellow / brown cast, most easily seen with white paper held behind it. I inherited a Kodak Chevron with an Ektar lens that’ll send my CD V-700 (γ & β only) to about 100 CPM γ (background is 14 – 20) and over 1000 CPM β with the shield open, at about 2 cm away. Though Thorium is an α emitter, its daughters are an interesting witch’s brew starting with Th-232 ->Ra-228-> Ac-228 -> Th-228-> Ra-224-> Rn-220->Po-216 and so on. An old thoriated lens is *more* radioactive than when it was brand new. Hi, a good way to make a calibrated test source is to grow a crystal of pure KCl. You can get food grade on Greedbay cheaply and simply mix some DI water and make a supersaturated solution. An interesting note, the crystals grown in this way or using salt substitute are a *LOT* more radioactive than just raw Losalt and well worth making just for the geek cred. They were most impressed with the pictures of my crystals! Plus with some careful arrangement you can even make a flat crystal and then encase it in resin with a PG end window to make a test jig for generating beta particles. Very cool! 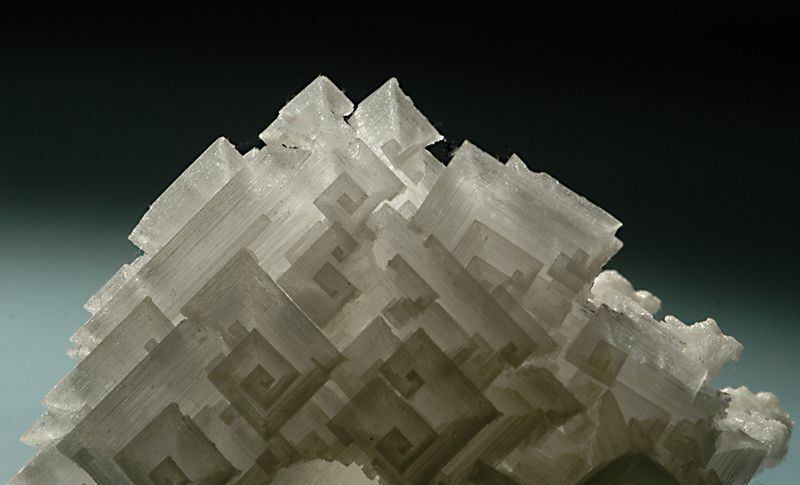 I hadn’t seen KCl crystals before, but a good image search shows that they can be striking when grown in the right conditions. Also, what’s PG? A type of plastic? I don’t see why a grown crystal of pure KCl would be any more radioactive, weight for weight, than the equivalent amount of “raw” KCl powder of the same purity. It might be more radioactive per volume, since it would be entirely KCl with no air trapped inside to reduce its density. It would be more radioactive than the same weight of “Lite Salt” or a similar salt substitute since these are about half KCl and half sodium chloride (table salt). I’m not sure whether it’s possible to purify KCl out of a mixture like this using selective crystallization… the solubility of those two salts is almost the same, so I doubt that this would work. Well at the very least growing KCl crystals from Lo-Salt ™ sequentially did get very nice somewhat mechanically robust crystalline forms. I did have some increase in count over time, possibly? after 3x sequences the radiation was maybe 20% higher for the same quantity. Wow, that is very hot indeed. I suspect a source that strong would saturate the SBM-20 geiger counter tube used in my kit! 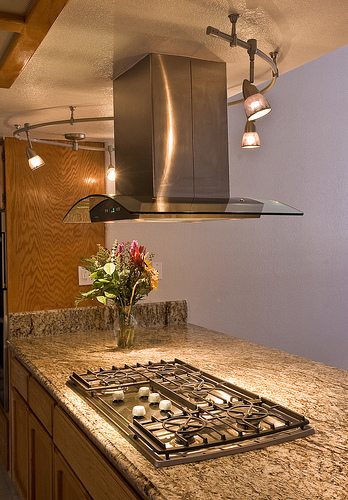 Watch out for radon gas, a well known radium decay product that can collect in enclosed spaces. I found out how to enrich potassium-40 if anyone is interested, my technique uses differential crystalization in an electric field. As others have mentioned, Potassium-40 is slightly radioactive. Home- and building-supply stores sell large bags of potassium chloride crystals, which are used to “recharge” ion-exchange water softeners and which are sold to customers who don’t want to use salt for this purpose due to being on sodium-restricted diets. A pound or two of this potassium chloride emits enough gamma radiation from its K40 content to be used as a low-level check source with most geiger counters… count rates several times background can be observed. On eBay you can find “alternative health” devices under the terms “Quantum pendant” or “scalar energy” – they’re discs made of some sort of lava rock, and are said to emit negative ions and be beneficial to health in all sort of mystical-sounding ways. The “negative ions” are almost certainly betas from radioactive decay. I got one of these “Quantum Science” discs, with a serial-numbered “scalar energy FIR card” for under $3 delivered. On my MightyOhm it reads out at roughly 3x background. On my homebrew scintillation analyzer with a small NaI crystal it gives around 15 CPS (background is 5-6 CPS) and the gamma spectrum shows a beautiful thorium line at 84 kEV and lead and radium lines at 238-241 kEV. I would not personally wear one of these next to my skin! I just assembled the Geiger kit last night, and I’m still looking for something ‘hot’. I live in Wichita, KS, where the Coleman company began. As a matter of fact, I work in an office that’s in a former Coleman warehouse. 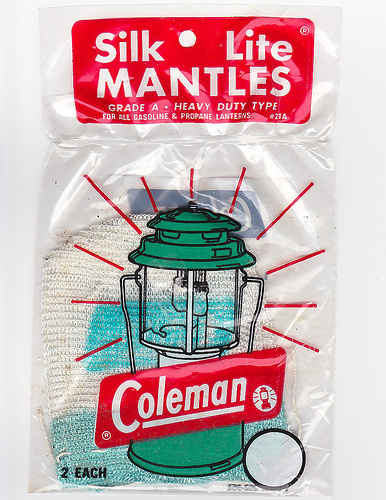 In the late 1990’s, a large part of Colman’s original factory was demolished due to radioactive contamination from the lantern mantles. The remaining historic factory was demolished last year, and a parking lot covers the former site. I’m going over there today to see if anything of interest is left. Not on your list is possibly the easiest test source to find — salt substitute. The NoSalt brand is available at any supermarket. Salt substitute is pure potassium chloride, so NoSalt is radioactive for the same reason that people and bananas are radioactive. Concentrations of potassium naturally contain a small percentage of radioactive isotope, potassium-40. NoSalt concentrates a lot more potassium than a banana or human, so the radiation from NoSalt is much easier to detect. I’ve heard of salt substitute being radioactive before, but I was never able to get much of a reading from it. Today I poured some Morton’s “Lite Salt” onto a plate and was indeed able to see a noticable increase in CPM when I brought my geiger counter close to it. I didn’t have my laptop hooked up at the time but I think it’s easily 2-3x the background level. This product is not 100% salt substitute (I think it’s 50% salt) so it makes sense that pure potassium chloride would be significantly more radioactive. Potassium40(K40) is a naturally-occurring radionuclide. Wherever there is potassium, there is potassium40. If there is enough potassium, the K40 can be detectable with a simple survey instrument. Half-life: 1.28 x 109 years; Decay Mode: Beta decay (89.3%). The beta maximum energy is 1.31 MeV. Gamma Rays: 1461 keV (10.7%). Daily intake of potassium element: 3.3 grams. Amount of potassium element in body: 140 grams (1.5 pCi/g or 55 Bq/kg of body weight). Typical K40 activity in body: 0.1 μCi; This means that there are over 200,000 atoms of K40 that decay in the body each minute! 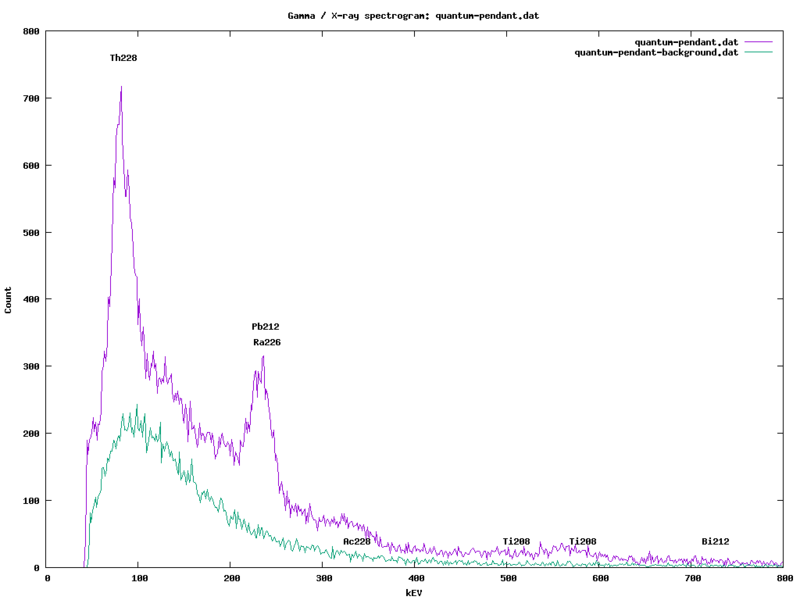 Typical K40 activity in soil: 10 to 20 pCi/g. Dose from Potassium40: The dose to a typical member of the population is approximately 15-20 mrem/year due to the K40 in the body and 10 mrem/year due to the gamma rays emitted by K40 in the environment (primarily the soil). The human body maintains relatively tight homeostatic control over potassium levels. This means that the consumption of foods containing large amounts of potassium will not increase the body’s potassium content. 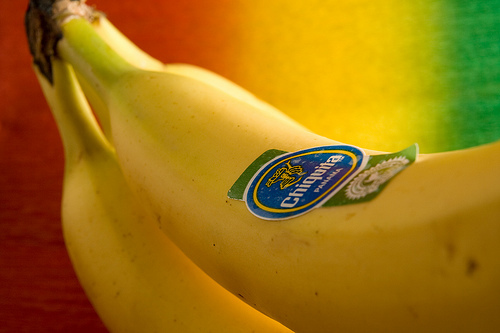 As such, eating foods like bananas does not increase your annual radiation dose. Tritium emits BETA, not alpha. And while beta is also blocked by the walls of the vial containing the tritium, the glass walls then emit secondary radiation (bremsstrahlung x-rays). The end result is that radiation from those little tritium keychain lights available on ebay are quite easily detected even through their glass walls and thick plastic cases. I have a small Tritium keychain (from Dealextreme) and I can’t detect any radiation from it. With my Inspector Alert, I measure (β+γ) ≅ 30.01 μSv/h at the surface of the vials. I uploaded a short video to YouTube showing the relative activity of three different tritium light sources. The first light was removed from the plastic keychain case. The second light was left inside its plastic case. The third is a rather large tritium light, but it’s past its half-life, yet while it’s not very bright any more it is still easy to detect. I get about 400 counts per minute from the first point source shown in the video. This will penetrate several layers of household aluminum foil… Background radiation is about 30 CPM. More appropriately it would be referred to as an electrode. In the case of TIG or GTAW, these electrodes are composed primarily of tungsten. If doped with thorium, they would be “thoriated” tungsten. I’m a bit worried because I ground many thoriated tungsten electrodes in my younger days… without much thought to the thorium laden dust I was breathing in. Thanks for the correction, I meant to say electrode. There’s nothing really wrong with using a smoke detector as a test source. The alpha particles from the Am-241 source won’t escape from the smoke detector’s casing, but the low-energy (60 keV or so) gamma rays from the Am-241 will. If you were to dismantle the unit and remove the Am-241 sealed source, that’s technically illegal in the USA because it’s a violation of the NRC’s General License for those devices, but it’s not dangerous – certainly less dangerous than an unsealed lump of uranium ore or a (sometimes very hot) radium-painted clock or instrument. It’s still a sealed source – the tiny amount of Am-241 is still sealed up inside it and doesn’t get out. If you put the exposed Am-241 sealed source right up to the GM tube, and the tube is sensitive to alphas, it will count the alphas, and not just the lower-abundance gammas from the source. If you ever have to get a radioactive bone scan done, you’ll be excitingly radioactive for about a day – enough so to get you into trouble at airports and border crossings even. I had this process done in November (sadly, before I had the MightyOhm geiger counter) and they inject Technetium-99M into you then wait a couple hours for it to bond with the calcium in your bones, then use a Gamma camera to image your skeleton. I did own an inferior geiger counter at the time (velleman kit, about 1/10th the sensitivity as the MightyOhm product) and from a couple feet away I was getting readings around 300 cpm. I imagine with the MightyOhm it would have been in the 3k cpm range. The gamma camera uses a sensor that’s a few hundred square inches and it was picking up around 2k counts per *second* while I was in the imager. Other potential sources of potassium: cream of tartar (potassium hydrogen tartrate, used in baking) and saltpeter (potassium nitrate, but not “Chile saltpeter” which is sodium nitrate). Ashes from burning wood can be collected, extracted with water, and boiled down to produce “potash”, which is used in making old-fashioned soap. “Soft” soap may be the potassium salt of the fatty acid, harder soaps are sodium salts. Rochelle salt (sodium potassium tartrate) used to be used in baking powders, but apparently not much anymore. So you may have some good potassium sources in your kitchen already! BTW, granite usually contains potassium feldspars, so even if uranium is absent you should get some signal.